If you had to picture one of the fastest growing markets in the country, perhaps the last thing you would think about is the rare coin market - yet it is undoubtedly one of the largest growing investors markets in the country. Every year billions of dollars change hands as coins are bought and sold by collectors in both public and private auctions. The market is hard to follow as not many people are interested in the strength of the market or how trade was affected on a month to month basis. It is possible though, to paint a picture of what the market looks like today, and what it may evolve into in the future as it continues to grow. The last 25 years have seen an explosion of interest in the trade and collection of rare coins in the US. The late 80's saw fewer than 2,000 bidders at an auction, whereas today over 10,000 bids can be made on a single lot at an auction. This heightened interest in the collection of rare coins and indeed, the whole of numismatics has also driven up the prices of the rare coins in question. 2014 saw the Professional Numismatists Guild report a 36% increase in total auction sales as compared to 2013, with a marked increase in sales of coins valued at over $ 1 million. The most notable sale has to that of gold Brasher Doubloon from 1787 which sold for a whopping $ 4.6 million. The coin, which was graded by the Numismatic Guaranty Corporation (NGC), was in mint condition and naturally garnered quite a bit of interest when it was put up for auction in early January of 2014. Other high value coins that are fetching huge sums at auction include Liberty Nickels from the early 1900's, Continental Silver dollars from 1776 and Double Eagle $20 coins that were struck between the late 1800’s to the early 1900’s. There are some 'low value' coins that have been attracting attention at auctions as well. Coins like the Lincoln cents made in the early 1900's are common among collectors but have recently been attracting attention. The 1909-S Lincoln cent regularly sells for four to five figure prices. The even rarer 1919-S, though not as sought after due to its poor strike quality, is steadily proving to be just as valuable. The market has been evolving at such a steady rate in part because of the 2008-2009 market crash that saw the country almost crippled by economic decline. Wall Street’s recent recovery though has seen a rise in wealth creation opportunities for many. This has resulted in an increased interest in the collection of rare coins that has contributed to the huge growth in the market that we can see today. The PNG currently estimates that the market is worth about $5 Billion, and that value is expected to rise in the years ahead. 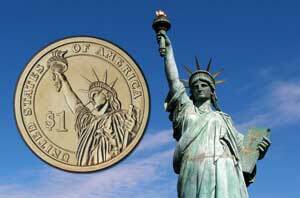 The U.S. coin market in particular may be one of the most overlooked markets in the country, and even global investors have something to gain by joining in. Individual low to medium and high end coin values continue to steadily rise. Auction activity has went through the roof. Higher acution activity is allowing wealth planners to more easily slip in and out of the coin market. Read our article on how to sell your coins. Many financial institutions and wealth managers are investing larger portions of their funds into the fairly predictable coin market. 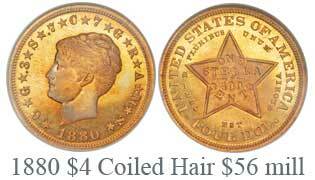 May 2nd 2015 - 1880 Coiled Hair Stella, Judd-1660, PR67 (Rarest of the Four Stella Varieties) sold for $56 million dollars.